Image Size: 17 X 26 in. Image Size: 26 X 40 in. After a period of personal loss, Steve Hanks began a series of paintings visualizing his healing process. 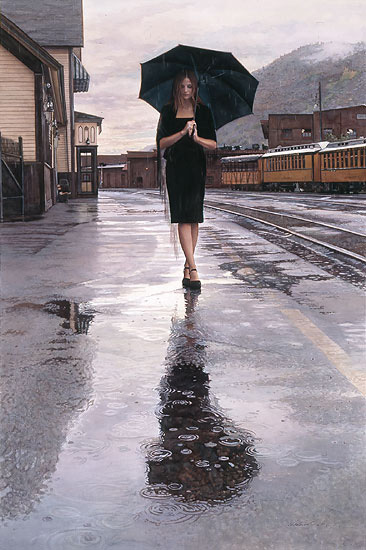 This inspiring series, which can be found in its entirety in the new book "Moving On: The Art of Steve Hanks", follows the artist’s emotional journey from despair to hope. "At this point I had come out of my sadness. I began to think about the future. I thought about the kind of person I would want to come into my life," says Hanks. "'Waiting in the Rain' is the visualization of that person, someone supportive and faithful. We would all like to have someone there waiting for us when we return from a trip."